(Lowell, MA) The author starts with a blank page. It fills with words. From where do the words come? 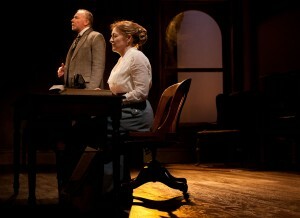 That is the underlying mystery of Merrimack Repertory Theatre’s masterful production of Ghost-Writer. This terse play dwells on the mystery of a great writer’s former secretary who seemingly channels her former employer’s spirit to finish his incomplete masterpiece. But the writer’s widow believes, or wants to believe, the secretary is a charlatan, exploiting her dead husband for literary gain. The play reveals in a series of monologues and flashbacks how we come to this precarious point, but we quickly learn that what we see may be the truth, or it may be what should be the truth, which, as the secretary says, is even more important than the truth. This is not an action-filled script, but rather a beautiful meditation on the terrifying loneliness of the creative process. The secretary, Myra Babbage (Rebecca Harris), seems equally haunted that the words seem to come from beyond the grave or that they may not. Above all, her greatest fear is that the words may stop, leaving her alone in a room, staring at a page that won’t yield. The flashbacks with her former employer, Franklin Woolsey (Dan Kremer), are agonizingly sweet, as we catch tantalizing glimpses of two creative souls slowly fumbling toward an artistic communion, only to know that it is destined for some loss, as is all creative process. If there’s any small knock on this play it might be that Michael Hollinger’s prose might be even better read aloud than staged. The play could have devolved into a didactic, yawning discussion on creativity, but director Charles Towers populates this meditation with three haunting characters, masterly performed by a talented cast. Harris captivates, switching easily between unimaginable loss and girlish humor. Kremer perfectly portrays the incomplete deceased author, who is more preoccupied with how to capture life on the page than how to life itself. And Maureen Garrett turns in a strong performance as his suffering wife and widow, Vivian Woolsey, with her angular features and menacing presence, Vivian could just as easily have been an over-the-top Wicked Witch of the West, but Garrett shows us the character’s own loss as a less-talented writer who loses her husband in degrees because she cannot reach the secret garden of his creative mind. Scenic Designer Bill Clarke and Lighting Designer Dan Kotlowitz also deserve special accommodation for creating a sparse world that offers just enough space to hold all the demons and angels of creation. This is a textured and beautiful show, one no one should miss who has ever tried to create love and beauty out of a blank page or canvas. This entry was posted in Drama and tagged 2012, April, art, Bill Clarke, Charles Towers, creativity, Dan Kolowitz, Dan Kremer, Ghost-Writer, Lowell, MA, masterpiece, Mauren Garrett, May, Merrimack Repertory Theatre, Michael Hollinger, mystery, Rebecca Harris, Vivian Woosley, writing by craigidlebrook. Bookmark the permalink.